You'll have to have more than a nice camera to really grow your photography business. It would be nice if it was that easy. Before I dive in, someone reading this may think their photography business is growing because they are staying busy. Don't confuse staying busy with making a profit and being sustainable for years to come. If you want to be a full-time photographer or already are full time, you have to treat your business like a business. With that out of the way, let's dive into some growth ideas. Portfolio - As a photographer, it's about your work which by the way will not appeal to everyone. However, you should work on getting a portfolio together that you feel good about. Keep in mind that it doesn't have to be 200 images. I think 20 good images in a portfolio would be far better than 200 mediocre. Once you have your initial portfolio in place, you should continue to improve on your work and ask for feedback from those who have seen your work. Again, no matter how good your work is, it will not appeal to 100% of the people who see it. As long as your portfolio is helping you get consistent business, don't worry about trying to please everyone because it will never happen. Marketing - It takes some form of marketing to grow any business. 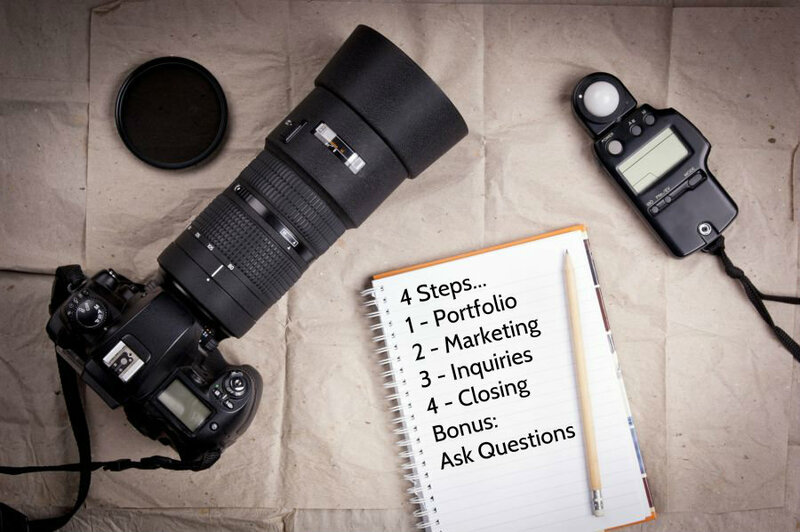 Even if you are simply sharing with family and friends that you can now help them with their photography needs, that is marketing. However, marketing can be far more in depth than that. For a photographer, it's important to get your portfolio in front of your ideal clients. There are multiple free ways to market your photography business like social media, free networking events, contacting people you know, etc. and there are numerous ways to pay for marketing. When it comes to paying for marketing, it's a good idea to find a resource like a book on the low cost end or hiring a marketing consultant for a few hundred dollars to provide direction rather than just winging it. It takes marketing to get inquires. Inquiries - Just because people start contacting you about your services, doesn't mean that you will close everyone you speak with. It's important to get an idea of how many inquiries it takes to close a sale because you'll likely have to keep the number of inquiries up to continue closing new business. Getting regular inquiries is why marketing your business is so important. Inquiries are nice, but it takes more than someone asking about your service: You'll need the ability to close the inquiry. Closing - This is where many people in all types of businesses fail. Once the inquiry comes through because of your marketing efforts, it takes some selling skills to get to the close. There are lots of videos on YouTube about selling and closing plus you can find a lot of helpful books and audios on Amazon. You may not like selling, but if you don't have the ability to sell your services and close the sale, your portfolio, your marketing and all those inquiries will quickly lose value. Check out 12 Commandments for Closing A Sale. However, no matter how good your work is and how good your selling and closing skills are, you will NOT close every inquiry which is why questions are so important. Why did you decide to or not to hire me? What did you like about or not like about my portfolio? Are you ready to move forward? If no, why not? Your goal with questions is to learn as much as you can and decide whether you need to change something about your business or not. For example, you charge $50 for a headshot and everyone that calls you says "that's expensive." Do you lower your headshot rate or target a different audience. I hope you know the answer. FYI, if you are charging $50 for a headshot in the Raleigh NC market, raise your price because you are far below the Raleigh area market value. $50 might be the price for an economically depressed rural area in Eastern North Carolina, but even then, it would be hard to make a living at $50 a headshot.